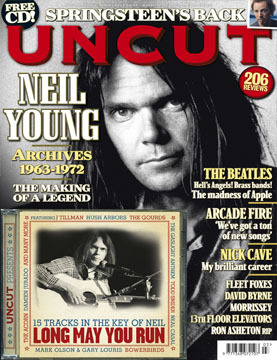 This month's Uncut.co.uk - Magazine previews Neil Young's Archives in anticipation of the February release which has since been delayed. One would think by now that anyone involved in publicizing the Archives would have learned that it's an effort in futility to preview the Archives based on predicted release dates. In October 1977, I reviewed Neil Young’s triple-LP retrospective, Decade, for what used to be Melody Maker. There was excited talk at the time about a follow-up, with more previously unreleased material, a rumour that circulated feverishly, causing a lot of excitement among Neil fans before things went ominously quiet. Nothing for a while was heard about what had by then been dubbed Decade II and the notion of another major retrospective somewhat receded. Then Neil, a couple of years later, started talking about something called Archives, a vast project spread over multiple albums, a trove of unheard songs reaching back beyond the Springfield to material recorded with the first groups he was in, including The Squires, Neil’s high school band of glimmering legend. This would have been at the start of the ’80s, and we’ve been waiting for it ever since. There have along the way been tantalising hints that Archives would be with us sooner than later, Neil on occasion promising that, yeah, finally, it was on its way. And then, last December, Archives appeared on Amazon’s forthcoming release schedule. We even got hold of a tracklisting for what would now be a 10-disc CD and DVD boxset and thus armed started tracking down as many of Neil’s past-collaborators as we could for this month’s cover story which we fearlessly predicted would coincide with its release. Disc 00 "Early Years '63-'65"
Half a dozen Squires tracks & then solo demos. Disc 01 "Early Years '66-'68"
17 tracks, mainly already available (mono) Springfield stuff. Last ever live cut features ("This is It"). 14 songs, inc. "Everybody's Alone" - mainly '69/'70 Crazy Horse EKTIK-era material. Unreleased mix of "Helpless" and live "I've Loved Her So Long" as well. 11 songs from ATG...also "Wonderin'"
JTTP (the film I guess and not the soundtrack). Also, Sharry "Keepin' Jive Alive in T.O." on Rust is interviewed for the article. Yeah Sharry! It should be noted that the issue includes a free CD "LONG MAY YOU RUN" with 15 brilliant tracks that share musical DNA with Neil Young, including The Gourds, Neal Casal, J Tillman and Hush Arbors. Order Uncut Magazine on Amazon.com . More on that beautiful girl we call the Neil Young Archives: A Fan's Desperation over the elusive and unattainable. Uncut is probably the best music magazine out there. Every issue is amazing. I was hoping the Neil Young issue would coincide with the Archives release but alas, itys not to be. Still, I can’t wait to get my hands on a copy of this. Cheers Allan Jones & Thrasher. So what happens if the Archives is finally released but the record label or Neil isn't happy with it and wants to change something, will they demand that we return it? Will they hunt us down like the Gestapo? Yes, he said that. And "Fork In The Road" [Explicit] is now on Amazon as a single download MP3 with a release date 3 february. Album will follow soon or at least within the next twenty years... Anyway, can somebody confirm that the first four NY albums will be re-released by the end of March? Guys!!!! Holy Crap! (Holy Grail?? )Live Springfield!!! 17 songs on the springfield disk. This is good news relative to the 13 tracks I had been calling out. Clearly the "hidden tracks" contain more goodies than I had anticipated with my math. Sure, this stuff is likely to be sonically inferior..which is why he's probably got it hidden on the DVD and not on the CD. Hmm... Just on Neil's releases, I have started seriously marching towards getting them all, well, what I can anyway, I have 25 as of yesterday. I just bought the Live at Massey Hall CD... BRILLIANT. It was quite awesome to hear him introducing the Harvest stuff as new tracks. I've searched a few discography pages and they are all different... Including The Squires, Buffalo, CSNY, SY, etc I'm up to 61 releases (albums) including 1 or 2 EPs and a couple of compilations and soundtracks... is this about right? I haven't even looked at video releases yet. ...Oh... has 'The Sultan' ever been released aside from the 'rare-as-rocking-horse-s**t' 45 they gave away at their gigs? Suckers! Fancy falling for the 'release date' Uncut! So Live at Canterbury is not going to be in the Archives box set? No, but you can buy the CD/DVD version now at your local record store.